Photo shoots are an integral part of being engaged and preparing for your wedding day, and you can expect your photographer to ask you to pose for some hand photos. Look at wedding albums and you will see that most will feature pictures of the couple’s romantically entwined hands or portraits of the bride’s hand displaying her engagement ring and her wedding ring. If you are getting ready to put your own album together, for sure you will want to have similar shots. This means treating your hands to a regimen that will make them look beautiful for your pictures. Here are some of the things you can try to achieve smooth, youthful looking hands. 1. Get a professional manicure. Getting a manicure is a great way to start a makeover regimen for them, especially if they have been neglected. A manicure will give your hands and not just your nails a new, pampered look. In itself this new look will be such a dramatic change you will find it easier to give your hands better care. Treat yourself to a manicure from a trained professional who will gently buff away any rough edges, moisturize your hands, and give them a good massage. Observe what she does and the sequence she follows, then try to follow what she did every night if you can. If the whole routine is too much for you to do every night, try to go it through at least 3 times a week. After your first manicure, schedule yourself for an appointment every 2 weeks to keep your nails looking good. If this is too much trouble for you, you can do our own at home. 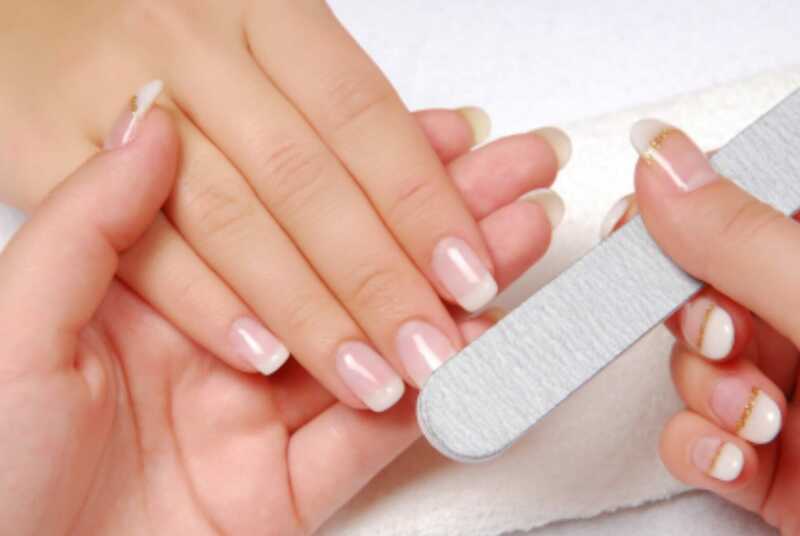 It is generally easier to do follow up manicures after a professional manicurist has done the initial work for you. Whether you keep going to a nail salon or do your nails at home after that first appointment, be assured your investment will pay off. 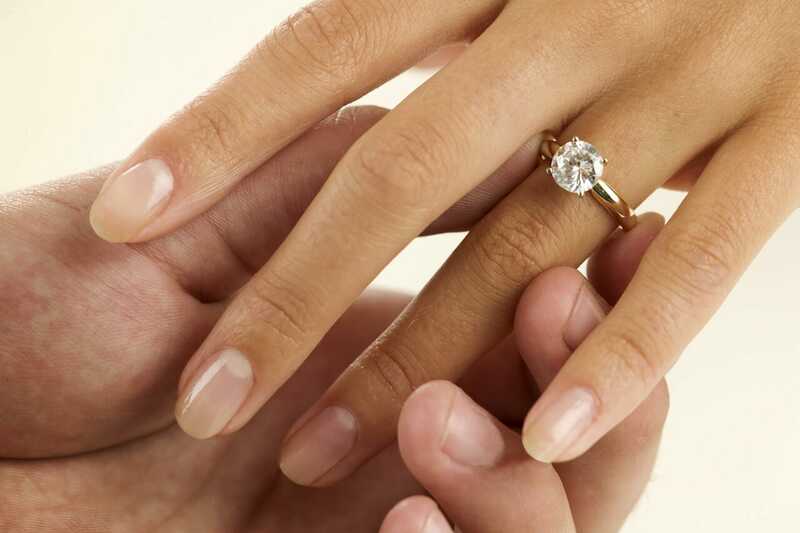 Remember, a pretty hand with well-manicured nails is the best way to show off a diamond ring. 2. Exfoliate for skin with a new, healthy glow. Removing old, damaged skin to expose new, unblemished skin is one of the oldest beauty tricks in the book. Exfoliating skin from your hands is a beauty routine you can do safely and easily in the comfort of your own home - unless the condition of the skin in your hands is so severe you need professional care. *Normal skin. Using a skincare brush or a soft washcloth, scrub the skin starting at the back of your up to way beyond your wrists. Do this gently, once a week or alternate this with a glycolic mask or a mudpack. A word of caution: Do not overdo. * Over-exposed skin. You can use glycolic pads every other day or 3 times a week. Clean and dry the skin at the back of your hands (and beyond, if you so desire), and then apply the pad as instructed. Moisturize skin after pad application, and use sun block to protect the newly exposed, tender skin. * Severely damaged skin. Sometimes skin has become so damaged home remedies are not enough to bring about the desired change. Microdermabrasion and light chemical peels are options for women and men who find themselves with skin in this condition, but only qualified professionals should do these. If you are thinking of undergoing either procedure, make sure you do so in a reputable, professionally certified clinic. 3. Keep your hands looking youthful by moisturizing them. Washing your hands frequently is a reliable way of keeping them clean and preventing the spread of disease. Ironically, frequent hand washing can also cause the hands to look so dry and unattractive. One of the first steps you can take to combat the results of frequent hand washing is to make sure you use a liquid cleanser that moisturizes while it sanitizes. If bar soaps are more your type, look for soap with moisturizing ingredients such as sunflower oil or soybean oil. There are many moisturizers in the market today. Upon application, these products will make the skin of your hands look plumper and more youthful. For best results, choose hand creams or lotions with shea butter, petrolatum, or glycerin. Also, pick those that incorporate a broad-spectrum sunscreen with an SPF of at least 30 to make sure your skin is protected. Moisturize as often as you can. To remind yourself to do this, put a jar of your favorite moisturizer on your night table, in the glove compartment of your car, on the kitchen sink and the bathroom sink. 4. Try some anti-aging creams and remedies if necessary. If you have age spots and other blemishes on your hands, you may want to lighten these by applying lightening creams. Most of these creams use hydroquinone as an ingredient, which facilitates skin cell turnover and reduces skin blemishes. However, some studies point to a possible link between skin darkening and heightened skin sensitivity. Therefore, such products should be used with caution. Instead of hydroquinone, some creams contain retinoid as their anti-aging ingredient. This has been cited as a milder treatment. If you want to make those blemishes fade but you do not want to resort to the use of commercial products with hydroquinone or retinoid, you can always try some home remedies. The fascination with fine, white skin is by no means a recent one and through the years, women have devised various concoctions to remove unwanted spots. This is especially true once the ring finger is adorned with an engagement ring. One such home remedy is apple cider vinegar mixed with an equal amount of onion juice. This is to be dabbed directly onto the blemishes. Still another remedy is plain lemon juice applied to the spots twice daily. Both of these remedies are trying especially since they both make use of non-toxic materials. By the time your photographer is ready to take your pictures, you will have gone through a hand beautification regimen for at least a month. Your hands are as nice looking and as ready for the photo shoot as they will ever be. Your photographer will surely want to take standard pictures of you and your fiancé’s entwined hands. He also takes pictures of your hand with your engagement ring and perhaps your wedding ring subtly but clearly displayed. At this point, you may wonder if your hands look pretty for the pictures that will figure prominently in your album. Don’t worry about this. Photography in this millennium has soared to new editing heights. Your photographer can now digitally remove any spots and scars you want banished from your picture. You can allow your photographer a free hand in editing your hand pictures so that there won’t be a wrinkle, spot or scar left for anyone to see. You can also ask for just a bit of editing to take away some of the spots while leaving a more realistic image of your hands as they really look. A hand portrait that has gone through the purification of Photoshop can be very nice but a few blemishes aren’t necessarily a bad thing. Through it all, the focus would still be on your diamond wedding ring. The story goes that Elizabeth Taylor, once acclaimed as the most beautiful woman of all time, was reluctant to have her tracheotomy scar removed because she said, “This scar is my badge of life.” Do not be overly concerned about the lines and veins on your hands because these are not only signs of a life well lived but these also speak of your ability to meet the future and make your marriage work.